One of the most common mistakes made in part design is the selection of a low-cost material in an attempt to save money. Inferior material grades, bad machinability, and improper compliance with environmental standards can all amount to headaches and expenses that erase any benefits from low costs. Fill out the form to the right to access and download your copy. 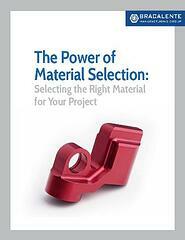 If you have any questions about material selection, speak with a Bracalente representative today.